The Coffee Gift Pack is beautiful, great for gifts and and can be used for any occasion! The Coffee Gift Pack bags are woven on a treadle loom in the heart of western highlands close to Totonicapan, Guatemala. 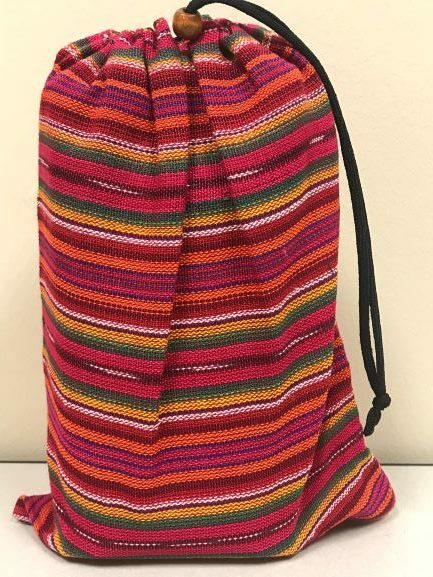 There are an variety of Coffee Gift Pack bags to choose from and each bag is unique in color and pattern. The Coffee Gift Pack is packaged in a black tin foil bag with a vent or a Kraft recyclable with a tin-tie, you choose. The Coffee Gift Pack fits one pound of whole bean coffee inside the Coffee Gift Pack. such as storing a variety of knick·knacks, gifting the bag to another, and many other uses! The best part of Coffee Gift Pack is that after you finish your coffee, you can still use the beautiful bag for multiple purposes such as storing a variety of knick·knacks, gifting the bag to another, and many other uses!